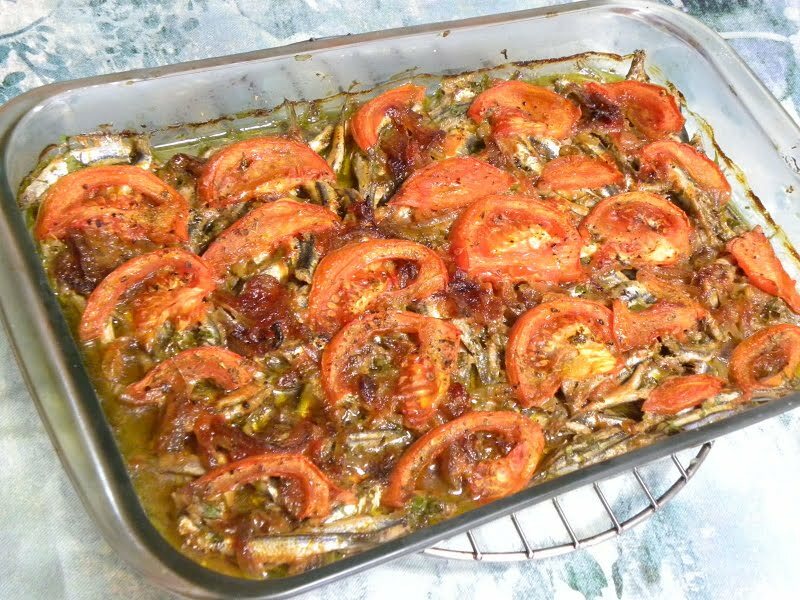 Gavros Plaki (baked anchovies) is a healthy and delicious dish which is also relatively cheap and that is why it is called “fish of the poor”. During the season it is fished in abundance it ranges around 4 – 5 Euros a kilo and when the catch is not good, around the period when there is full moon, it reaches maximum 10 Euros a kilo. However, we are very grateful it is still cheap as it is delicious and can be cooked in many ways. Fish like anchovies, sardines etc., also known as “foam fish” are a good source of Omega 3 fatty acids, which are not only good for our heart, kidneys, and digestive system, but also to help in treating depression and other brain disorders. With the sudden economic crisis, the only thing you hear people talking about is how they have been affected by the measures taken and how they cannot cope any more. Everyone is feeling depressed and suicide rates have risen tremendously. This is why we should eat fatty fish at least twice a week. Cooking this dish with extra virgin olive oil (rich source of monosaturated fatty acids, antioxidants and vitamin E and many more properties), tomatoes (lycopene, potassium etc), garlic (allicin), red onions (flavonoids, quersetin as well as allicin), parsley (Vitamins K and C) makes this dish perfect for your heart, mood, health and don’t forget your pocket. When making this dish, if I have the time, I prefer to fillet the anchovies. This is time consuming and labour intense but you can always add the fish whole, only removing the head and guts. When gavros is not too big you can also eat it with the backbone if you like. In this case finely cut all the vegetables and mix. In order to clean and fillet the fish, just pull the head and the guts will also be removed. Then with a sharp knife score the belly and separate both pieces. Take the backbone from the top and pull it gently, moving towards the tail. Cut the tail with a knife. When making this dish again today, I decided to make it a bit different by not filetting the anchovies and sauteing the onions and garlic. I had only one ripe tomato home so the other was substituted with some tomato paste. We loved the outcome and this is how I will be doing it from now on. Cut the head pulling out the guts. Then wash and let it drain. Heat half of the olive oil and sauté the onion until almost beginning to brown. Add the garlic and mix until fragrant, for a few seconds. Add the tomato paste as well as water, mix and cook for five minutes. Put the anchovies in a Pyrex and season with salt, pepper, oregano and thyme. Add the parsley and mix. Pour the sauce on top, coating the fish evenly. Cut the tomato in the middle and then finely chop it into thin slices. Add a layer of tomatoes on top and season it with salt, pepper and oregano. Finally add the remaining olive oil on top of the anchovies. Bake in a preheated oven to 180o C for 45 minutes, without mixing and without adding any water. Gavros Plaki (baked anchovies) is a healthy and delicious dish which is also relatively cheap and that is why it is called "fish of the poor". Cut the head pulling out the guts. Then wash and let it drain and season with salt and pepper. Chop the onion, garlic and parsley and add some salt and oregano and mix. Cut the tomato in the middle and then finely chop them and season with salt. Begin by adding a layer of tomatoes in a baking pan or Pyrex. On top add some of the onion, garlic, and parsley mixture. Put a layer of anchovies with the skin facing downwards. Add some more onions, garlic and parsley. Put the remaining anchovies, skin now facing upwards. Put the remaining onions, garlic, parsley and oregano. Finish with a last layer of tomatoes, salt and oregano. Finally add the olive oil on top of the anchovies. Bake in a preheated oven to 180o C for 45 – 50 minutes, until vegetables are cooked, without mixing and without adding any water. What a healthy and tasty dish! I’d love to eat some of that for lunch. MY mother loves anchovies.. so simple, yet packed with flavor!! So glad to see an anchovies recipe. My daughter is very fond of this fish and I was wondering how I could cook them. Thank you Ivy! My mother makes them the same way! Amazing! Ivy, this looks so good and healthy! I have had anchovies prepared in a similar way and I agree that they are excellent. Mmmmm, so delicious Ivy! I love anchovies in all their ways… and yes here are the fish of the poor too… and these days with this crisis is the fish to buy! Mmm, looks like a delicious recipe. I quite like anchovies even though not too many of my friends do. I adore fresh anchovies especially prepared “Greek style”! Lots of ladi for me! It sounds amazing,Ivy! love the flavors…Simple and delicious dish. I love anchovies Ivy! This would be a special treat in my house! My husband loves cooking with sardines but I don’t remember ever seeing anchovies on the market. Curious. But I love the recipe – and I’ll bet it will work equally well with sardines. And the health benefits should push me to cook with these fish more often! Ivy, this dish looks delicious, I never cooked anchovies, but love it when had it in restaurants…like it with the olive oil and they way you prepared it…simple and yet so tasty.